After a year of doing fashion campaigns, this movie star bombshell just can't get enough and starts off the year with another Megan Fox Armani 2011 Underwear Ad. Having done Armani Jeans print ads, commercials and beauty spots, it's no wonder that she is still the face of the new underwear campaign. In black-and-white images, she is joined by a male counterpart Rafael Nadal to help represent the brand. 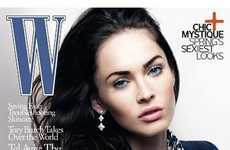 The Megan Fox Armani 2011 Underwear print ads are just a hot preview with more sizzle to come.